Till the end of the nineteenth century, historians thought that Greek civilization started around the eight century BCE, about 200 years before the time of Buddha. In 1871, a German businessman,Heinrich Schliemann, started looking for ancient Greece by excavating sites mentioned by the blind Ionian poet Homer and Schliemann’s work led to the discovery of a lost Greek civilization which was named after Mycenae, an important city of that time. 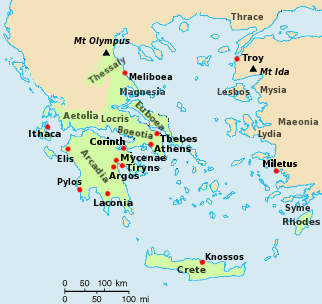 The Mycenianians were Greek speaking tribes who moved into the Greek peninsula around 2000 BCE. This civilization which reached the peak in the period from 1400 to 1230 BCE consisted of several small states, each with its own ruling dynasty. Thus the antiquity of Greeks was pushed back about 1200 years and was pushed further back when British archaeologist Arthur Evans discovered the Minoan civilization on Crete. Schliemann’s contributions did not end there. Interested in the location of Homer’s Troy he started digging for it in Turkey. Though British archaeologist Frank Calvert had identified Hissarlik as the site of Troy, his work was over shadowed by Schliemann who published Ithaka, der Peloponnesus und Troja in which he claimed Hissarlik as the site of Troy. This is now accepted by historians. If Karunanidhi was alive in late 19th century, he would have told Schliemann that Iliad was a myth and he should spend his time putting up his own pictures all around the city. Thanks to the work of Heinrich Schliemann, Frank Calvert, Manfred Korfmann and many others, it has been proved that there was history behind what was labeled myth. Not related to the post. Have you seen this podcast? You probably know all about it but I found it an excellent series on Byzantine rulers. Kuttan, wrong URL, but I know what you are talking about. I listened to that series till the time of Julian since I was reading a Gore Vidal’s book on Julian at that time. Speaking of podcasts, if you have iTunes installed, go to iTunes store, and then from there to iTunes University/Stanford and get the “Historical Jesus” series by Thomas Sheehan. It is free.